The EBGC unit is designed to study and understand the different processes given during the biogas generation through anaerobic breakdown, as well as the study of the different parameters that affect the anaerobic digestion itself and the value of the obtained biogas. The unit is supplied with two packed anaerobic digesters. 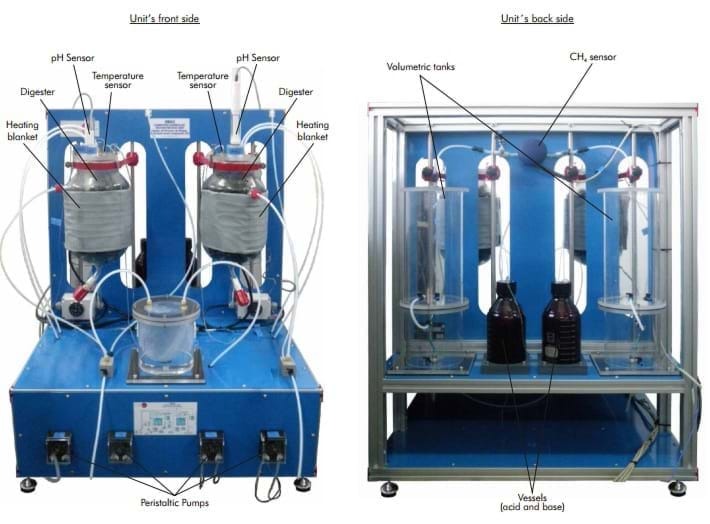 In this way, the user can work either in only one stage or in two stages, separating the different phases of the digestion process (the processes of hydrolysis, acidogenesis and acetogenesis would take place in the first digester, and the methanogenesis in the second digester). Both digesters have a heating blanket that allows to regulate both the appropriate temperature for each part of the process and the operation with different ranges depending on the used microorganisms. Thus, it can operate at the psychrophilic range (room temperature), mesophilic range (temperatures around 35ºC) or thermophilic range (temperatures around 55ºC). The unit has four peristaltic pumps which enable the propelling of both the supply to be introduced in the digester and the acid and the base (introduced in two vessels located at the rear side) in order to adjust and control thoroughly the pH in each stage of the process. In case of working in an anaerobic digestion in two stages, one of the pumps carries the product from one of the digesters to the other,passing through a buffer tank which collects the excess of flow from the first reactor. The control of these pumps allows to know the different flows with which the unit is working. Two volumetric tanks are also included for the storage and volume measurement of the generated biogas. The generated biogas flows through a pipe from the upper side of the digesters to these tanks, where the biogas volume is measured by means of a water displacement. Such tanks have two parts: the upper side is where the generated biogas is collected and the second part, smaller than the first one and located below it, is used to collect the displaced water. Each digester has a temperature sensor and a pH sensor. Their function is to follow the whole process and study the influence of the different controlling parameters in the anaerobic digestion. Finally, the volumetric tanks, by their upper side, enable the flowing of the collected biogas through a pipe and its passing through a methane (CH ) sensor. This sensor allows to know the methane concentration in such current. This way, the biogas quality depending on 4 the physical-chemical conditions under which the anaerobic digestion is developed can be determined, as well as its value as a renewable energy source. 2 Packed anaerobic digesters of 5 liters. Reactors packing: 25 mm. diameter bactoballs. heating temperature. Temperature range: 0-90ºC. 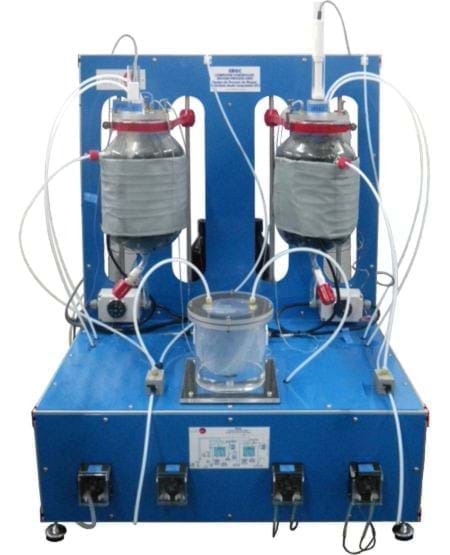 4 Peristaltic pumps, 50 cc/min, computer controlled. Feeding flows measurement by the pumps calibration. 2 Volumetric tanks for the storage and volume measurement of the generated biogas. Buffer vessel, of 1 l. of capacity. 2 Pyrex vessels, of 1 l. of capacity, for the acid and the base. Waste tank, of 12 l. capacity. Methane sensor to measure its concentration in the generated biogas, 0-100%. 2 Temperature sensors, “J” type. The Control Interface Box is part of the SCADA system. All sensors, with their respective signals, are properly manipulated from -10V. to +10V. computer output. Sensors connectors in the interface have different pines numbers (from 2 to 16), to avoid connection errors. Single cable between the control interface box and computer. connections during the whole process test procedure. Simultaneous visualization in the computer of all parameters involved in the process. Real time curves representation about system responses. Storage of all the process data and results in a file. displayed on only one screen in the computer. Shield and filtered signals to avoid external interferences. Possibility of automatization of the actuators involved in the process.